I'd like to draw your attention to a fairly new blog I've linked to called "The Fairy Tale Cupboard". It's run by Claire Massey, the Editor of New Fairy Tales magazine, and is a wonderful treat to read. My favorite feature would have to be the Profiles of Famous Fairy Tale Figures. If you like Sarah Beth Durst's obscure fairy tale commentaries, you'll love these profiles. They're entertaining and educational and a wonderful summary and resource for study. So far Red (of Riding Hood fame) and Jack (the Beanstalk Jack) have been profiled and we've had information on their names, ages, relationship status, story variations, online appearances and more. Who Has Come To Sing Us Carols? This is just one of the amazing fairy tale artists Claire Massey has 'discovered' for us. And there are little surprises too, like the recipe for a cake especially for Red's Granny (it has rum in it). Fairy Tales and... : a series of subjects and their relation to fairy tales. Posted so far: Fairy Tales and Shadows, Fairy Tales and Beds. I love this feature too. Fabulous articles! FoFTs (friends of fairy tales): info about wonderful people who work tirelessly to share and promote fairy tales. These are people we should all be aware of, being fairy tale enthusiasts. 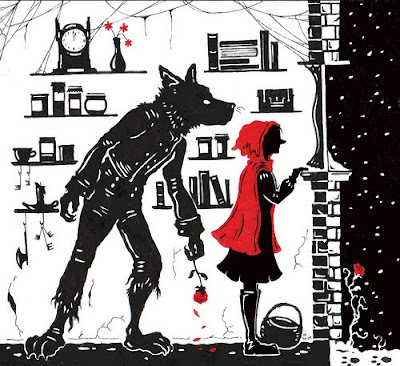 Fairy Tale Treats: art, books and other lovely fairy tale related things. Claire has a real knack for finding gorgeous art/illustrations and objects. This is evident in the magazine too. You can find The Fairy Tale Cupboard HERE. So there's plenty of fairy tale related work coming from this talented woman, even between issues of New Fairy Tales online magazine. Speaking of NFT, Claire is hard at working collecting and editing stories and commissioning gorgeous artwork for the next issue. If you'd like to contribute either writing or art, please contact Claire at editor AT newfairytales.co.uk and make sure to read the submissions information HERE too. 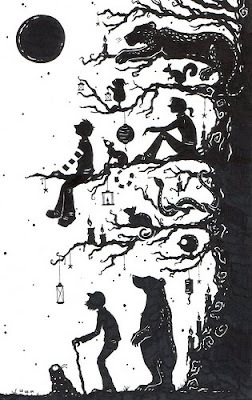 Her work is featured in the first issue of New Fairy Tales.